The Looking Glass House is one of those novels that seem to be one thing, yet turns out to be something completely different. Sometimes this leads to a delightful surprise, other times these wrong expectations result in disappointment – as was unfortunately the case in this instance. 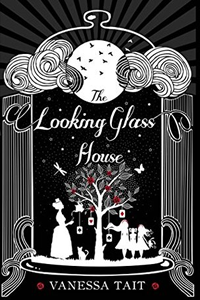 Written by the great-granddaughter of Alice Liddell, the girl who was the inspiration behind the classic character of Alice from the Wonderland novels, The Looking Glass House is a fictionalised retelling of Alice's true childhood. The lives of the Liddell sisters is seen through the eyes of their governess, Mary Prickett, who becomes fascinated by a family friend, Charles Dodgson, who in turn seems incredibly fond of the three young sisters, Alice in particular. He always takes the girls' photographs and asks them away on trips and one day Mary hears him tell an absurd yet enchanting story about Alice in a magical land. Dodgson is nowadays of course better know as Lewis Carroll, the author of the aformentioned Alice in Wonderland, and from the moment that this became clear within the novel I felt incredibly intrigued by the hints to the wondrous tale that were sprinkled throughout and served as the seeds for Dodgson's classic novels. It wasn't only the three sisters I recognised from within the pages of the children's classics, but family acquaintances too and even the governess central within The Looking Glass House made an appearance. It was a marvelous treasure hunt through Victorian England and Dodgon's imagination – and one that with my love for the original Wonderland tales and whimsical characters I wish could've been the sole focus of the novel. Unfortunately this wasn't the case. As the story progressed it took a more bizarre turn, one that seemed to come completely out of the blue considering the novel's cover and blurb, and it really wasn't something I felt interested in reading. It didn't help that Mary slowly but gradually turned into the unlikeable creature befitting the nickname so cruelly given to her by Dodgson and Alice, as it was difficult to continue to care for a character and story that made me feel so deeply uncomfortable and shattered my childhood illusions about a magical land and charming cast of characters to match. Admittedly, I'm generally not a big fan of historical fiction nor reading about Victorian times, so perhaps it's partly my own fault for being led by an intriguing synopsis and magical cover, but The Looking Glass House just wasn't what I expected and hoped it to be. Instead of letting me return to the wondrous tales I grew up with, it has now forever changed my perspective in an unfavourable way – and that's a shame.